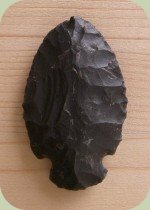 Flint knapping is the age-old art of making arrowheads and other edged stone tools. Hunter-gatherers relied upon this key wilderness survival skill to create important tools and hunting implements. 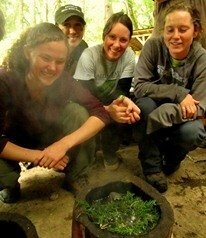 Many people continue to practice the skill today, including traditional bowyers, experimental archaeologists, and primitive skills enthusiasts. 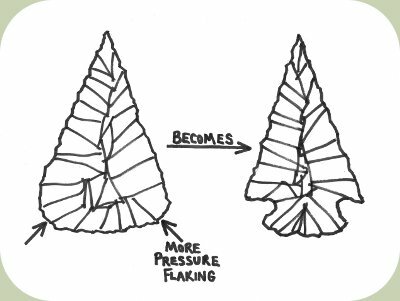 At its most basic level, flint knapping consists of: breaking open a piece of parent material (called a core); striking flakes off of that core; and then shaping those flakes into the intended tool. Because flint knapping includes breaking apart rocks with force, where sharp flakes can fly off in any direction, it is very important to wear safety glasses. Gloves, shoes, and sturdy pants are also highly recommended. It is also important to flint-knap in a place where you can easily catch the sharp flakes that will fall to the ground (so that they are not accidentally stepped-on). You can put down a tarp or sweep up afterwards. Also, use a well-ventilated area, so not to breathe the dust created by breaking rocks. When it comes to the ethics of flint knapping, the primary concern is to be mindful of the archaeological record. To an archaeologist, piles of flaked stone (debitage) can indicate the presence of an ancient village or camp. To prevent your work from being confused as archaeological evidence, always add a penny or two to your pile of debitage and be sure to sign and date your completed work with a diamond-tipped pen. The best stones for making arrowheads include flint, chert, obsidian, jasper, quartzite and other stones that are somewhat brittle and have a fine-grained, uniform texture that is free of cracks, fissures, and fractures. Glass and porcelain can also be used. You can also tap the stone and listen to the pitch. Stones that produce a higher pitch when tapped are generally better for knapping. To break apart and shape your material you will be using some simple tools for percussion and pressure flaking. These tools can be made out of antler, soft metal, soft stone, bone, or very hard wood. The best pressure flaking tools are made with an antler or copper tip. Percussion flaking is the act of striking your material to break it apart in a controlled manner. 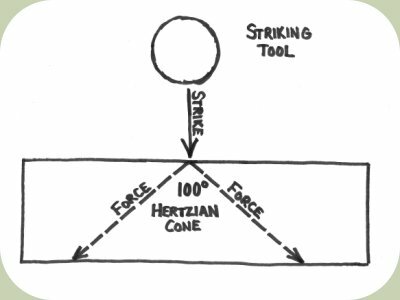 In a uniform material, the force from a strike moves out from the point of impact in a cone shape that is roughly 100 degrees wide. This is called a Hertzian Cone (see figure 1). Understanding this concept of how forces move through stone allows you to angle your stone to break it apart in an intentional way. If your parent material (also called a core) has rounded edges, the first step is to break it apart so that you have good edges to work with. This can be done by using a large hammering tool. The goal is to create platform edges that are less than 90 degrees (see figure 2). 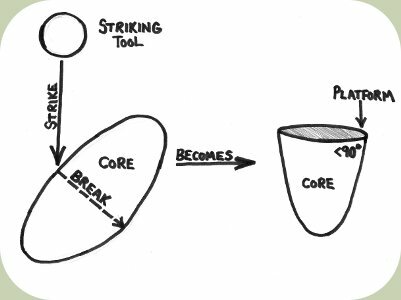 The next step is to strike flakes off of your core using smaller striking tools. It is these flakes that you will be further shaping into implements such as arrowheads (see figure 3). 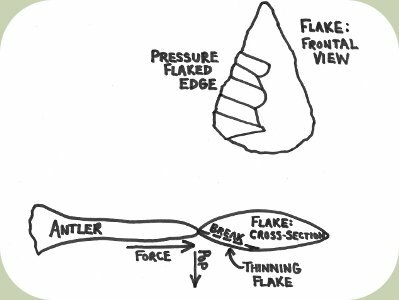 Pressure flaking is the act of using a pressure flaking tool (such as an antler) to load significant pressure against an edge and then popping off a long thinning flake. 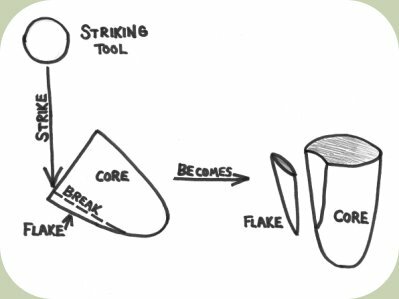 Pressure flaking allows a flake to be carefully shaped down into the finished tool. To pressure flake, an edge often needs to be strengthened by abrading it to remove thin weak pieces. A platform is then picked out, which is a point on the edge that sits below the centerline of your flake. The pressure flaking tool is then pushed onto the platform with significant force and a small thin flake is popped off of the piece (see figure 4). Notching is the final step in making arrowheads. The notches are made using a combination of pressure flaking and abrading to carve out the gaps that allow the arrowhead to be bound to an arrow shaft (see figure 5). You now have a completed arrowhead. You can haft it onto an arrow shaft and begin working on another. Happy knapping! A great material to start working with is beer bottle bottoms. It allows you to practice and learn the concepts before spending money on expensive stones. Here is a great article on making arrowheads from beer bottles. The Art of Flint Knapping by D. C. Waldorf.